Nine years ago, in 2009, the philanthropy sector was facing critical challenges on a number of fronts. The sector and the country was just starting to recover from the Great Recession of 2008. Funders were trying to meet their missions amid a significant drop in assets and grant dollars at the same time that there was a rapid increase in human needs in their communities. This prompted many in philanthropy to strengthen their relationships with state and federal policymakers, so that public and private dollars could be better aligned to achieve mutual goals. At the same time, Congress was continuing its scrutiny of philanthropy, which included lawmakers floating some particularly draconian new rules and regulations. The share of regional PSOs allocating some staff time to policy work (either part-time or full-time) has nearly doubled, increasing from 45% in 2009 to 84% in 2017. Most regional PSOs (87%) now facilitate relationship-building between their philanthropy members and local or state policymakers, up from 43% in 2009. Only a third of regional PSOs (35%) provided resources and tools to help their members effectively engage with policymakers in 2009, compared to 71% in 2017. The share of regional PSOs that provide educational briefings to policymakers has more than tripled, from 21% in 2009 to 68% in 2017. The report shows that regional PSOs have made notable gains in their public policy capacity not just over the past nine years but in just the past year as well. For example, 44% of regional PSOs report that their allocation of staff time for policy work in 2017 was clear and adequate to achieve their policy work objectives, up from 29% in 2016—an increase of 15 percentage points in just one year. Likewise, more than half (56%) of regional PSOs report that their staff had the right mix of skills and expertise to achieve their current policy objectives, up from 45% a year ago. Another key report takeaway for me—and one that of course makes me proud—is that at least some of the growth in regional PSOs’ policy capacity can be attributed directly to support they have received from the Forum. For example, most regional PSOs (83%) say they have improved their understanding of current trends related to policy issues over the past year, and 96% of these PSOs report that the activities and resources provided by the Forum directly (68%) or indirectly (28%) supported this change. On the critical issue of the 2020 census, nearly three-quarters of regional PSOs (71%) conducted education and outreach activities with their members last year to raise awareness about how and why grantmakers should help to ensure an accurate census count, and 96% of these PSOs said the Forum supported these efforts directly (68%) or indirectly (28%). The dramatic growth of regional PSOs policy capacity is benefiting philanthropy and communities in numerous ways every month throughout the country. It’s the Minnesota Council on Foundations advocating in 2018 for a state tax credit to grow charitable endowments to benefit communities across the state. It’s Philanthropy California successfully convincing the California Legislature in 2018 to significantly increase state allocations for 2020 census outreach. It’s Philanthropy Ohio advocating in 2018 for the effective expansion of Medicaid in the state. The list goes on. 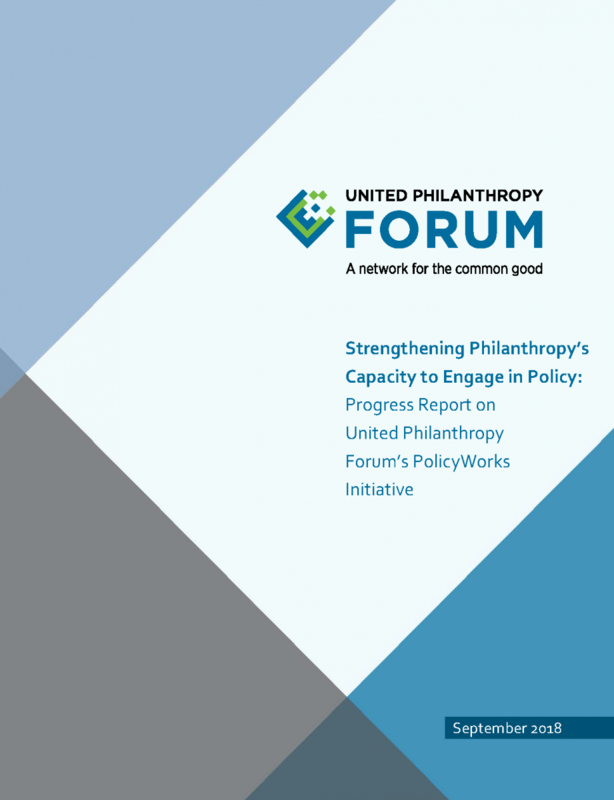 The value of philanthropy’s engagement in government relations, advocacy and policy work has only grown in importance since the Forum started the PolicyWorks initiative nine years ago. We look forward to continuing to grow and adapt our efforts to help build the capacity of regional and national PSOs to engage in policy work, to help ensure a strong and growing environment for philanthropy and to maximize philanthropy’s impact on critical issues for the health and well-being of communities across the country.